It’s what’s NOT on the inside that counts! We’re very proud to be listed in Naturewatch Foundation’s Compassionate Shopping Guide and support it in its aims, helping consumers to make informed choices and campaign for cruelty-free via purchasing power. 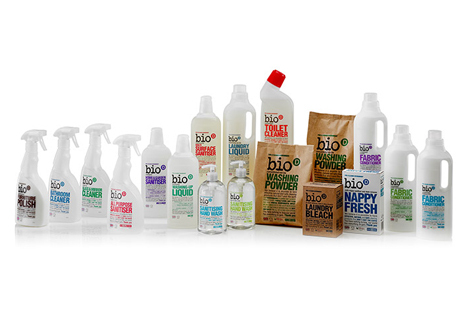 Bio-D is the UK’s leading producer of home cleaning products, and an independent company at that. We have been wholly cruelty-free since our inception 25 years ago, when founder Michael Barwell launched Bio-D after realising that household cleaning products contained many of the same harmful ingredients in the products he used in his job as a ship cleaner (which required the use of industrial protective clothing and equipment, including a respirator). There are brands on the market that use ingredients that cause harm to humans, animals and the environment. We aim to create ethical, affordable alternatives for people who want to live in a healthier way and for people who care about the planet we live on. While we never set out to create a cheap product, we are passionate about providing fantastic products that don’t cost the earth. We’re proud of our funky (recycled and recyclable) packaging, but overall it’s about what’s NOT on the inside that counts! Phosphates: used as water softeners and to improve cleaning, phosphates can stimulate excessive growth of algae in the receiving waters. These algae often grow in such great numbers that the water becomes starved of oxygen, killing fish and plant life. This condition is known as eutrophication and exists in Lake Erie, North America, which is practically devoid of all marine life. Urea: In some cleaning products you will find animal urea (derived from urine). It breaks down chemical bonds in proteins and it is cheap and plentiful in supply. Lanolin: the wax secreted in wool bearing animals. Lanolin for cleaning products is often sourced from the cheapest grade sheep stock, often in poorer health than food grade or medical grade stock. Tallow: an animal triglyceride derived from beef fat. Tallow required for cleaning products is usually sourced from intensively farmed animals as it is the cheapest source. Also OFF our list are: EDTA (Ethylenediaminetetraacetic Acid); enzymes; optical brighteners; triclosan; GMO / SMO (Genetically or synthetically modified organisms); chlorine bleaches; petroleum-derived additives; chemical plasticisers; glycerine; sodium tallowate: synthetic dyes; synthetic perfumes; titanium dioxide. From Laundry Bleach to Lavender Washing Up Liquid, Geranium Hand Wash to Home and Garden Sanitiser, we are proud to be cruelty-free across our whole range.